Primary lung cancer is the uncontrolled proliferation of malignant cells in the airways and air sacs of the lungs. Lung cancer is an aggressive cancer that can spread to other parts of the body. The majority of lung cancers are caused due to excessive cigarette smoking. Research shows that in some cases, passive smoking is also harmful than. In India, excessive exposure to pollution which may contain poisonous chemicals is the next most common risk factor. Exposure to harmful radiation over a long period of time alters the natural make-up of cells causing cancer. People working in areas related to asbestos manufacture are more at risk. Increased risk of lung cancer is an occupational hazard for people working in asbestos factories. Persistent low grade fever with paleness of the skin. Sometimes the skin may become grey and dry. Lung cancer is of two basic types – non-small cell (NSCLC) and small cell lung cancer (SCLC). Of these the non small cell lung cancer accounts for a majority of cases of lung cancer. it grows and spreads more slowly than small cell cancer. The small cell lung cancer grows and spreads very rapidly to other parts of the body. The doctor examines the chest area with a stethoscope in which a persistent wheezing sound acts as an alarm. Localized wheezing may be noticed, which is the low almost musical sound emitted when there is partial blockage in the air passages of the lungs. A chest X-ray is usually advised, which can show the cancerous lesions in the lungs. Sometimes, fluid may accumulated in the chest, and a sample of the fluid from the lungs may be taken for testing. A needle is inserted through the chest wall and some of the fluid is extracted. A sample of the sputum may also be taken to check for malignant cells. Bronchoscopy is a procedure in which a thin lighted tube, called the bronchoscope, is passed through the mouth, via the wind pipe (trachea) into the lungs to examine the inside of the air passages. If a lesion is seen in chest X-ray or bronchoscopy, a small amount of the lung tissue is taken or biopsied for laboratory testing. 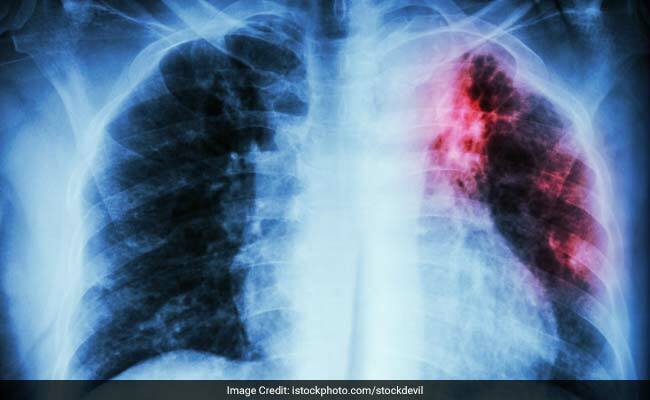 What is the treatment of Lung Cancer? Since lung cancer tends to spread throughout the body, chemotherapy is the most common form of treatment. Chemotherapy drugs include doxorubicin or adriamycin, vincristine,and etoposide. Radiation therapy may be used if the exact area of the origin of the tumour is located. In some cases, surgery of the lungs may have to be carried out. The procedure involves the removal of only the tumour, a lobe of the lungs or the whole lung, depending on the location of the tumour and the extent of damage. Lung surgery is a major operation and the patient may need to be in hospital for several days following surgery. The patient must breathe deeply and frequently to expand the lung tissue which aids in recovery.